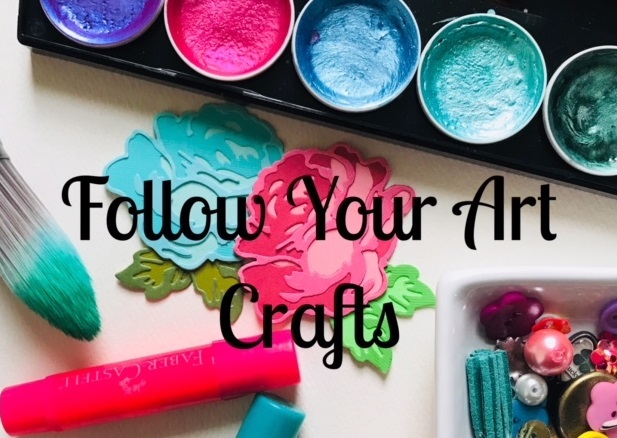 Hello again, crafty peeps! 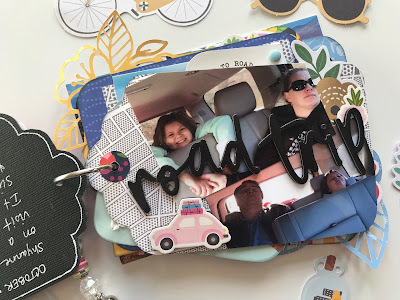 As promised, I have a bonus post featuring the mini album documenting my mini road trip to Vermont with family using the March main kit from My Creative Scrapbook Kit Club. It is filled with the new Pebbles Chasing Adventures collection. 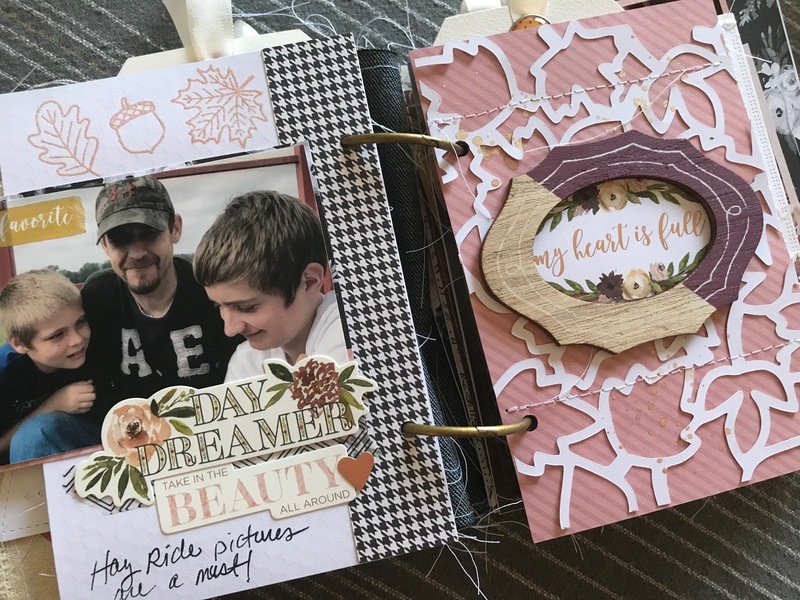 I loved creating this mini album and it was so easy to do! 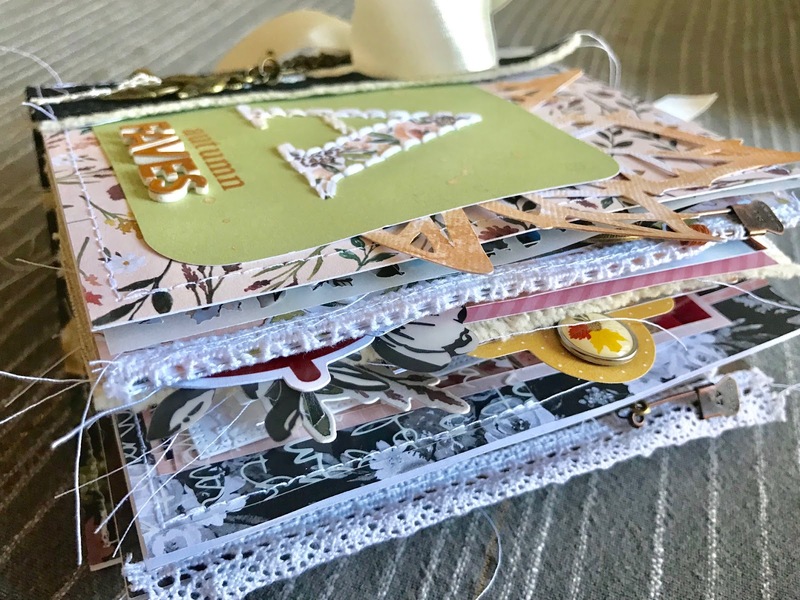 mini albums don't always have to be about big adventures or have fancy albums or binding. 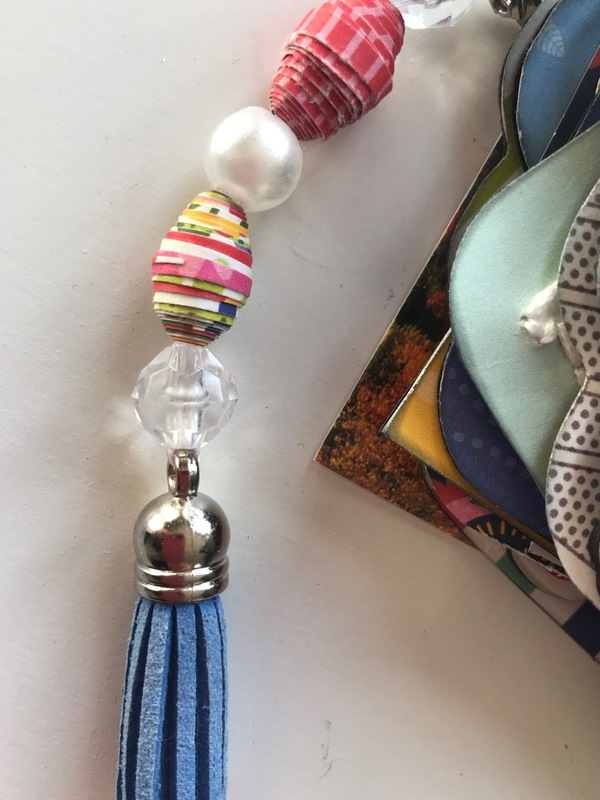 Mine has beautiful patterned papers with a binder ring and cute handmade paper bead charm and I am super happy with the way it turned out! I started with this months exclusive cut files available for free on the website under the "Add on kits" tab. Scroll to the bottom of the page and you will have access to all of the current and past cut files. 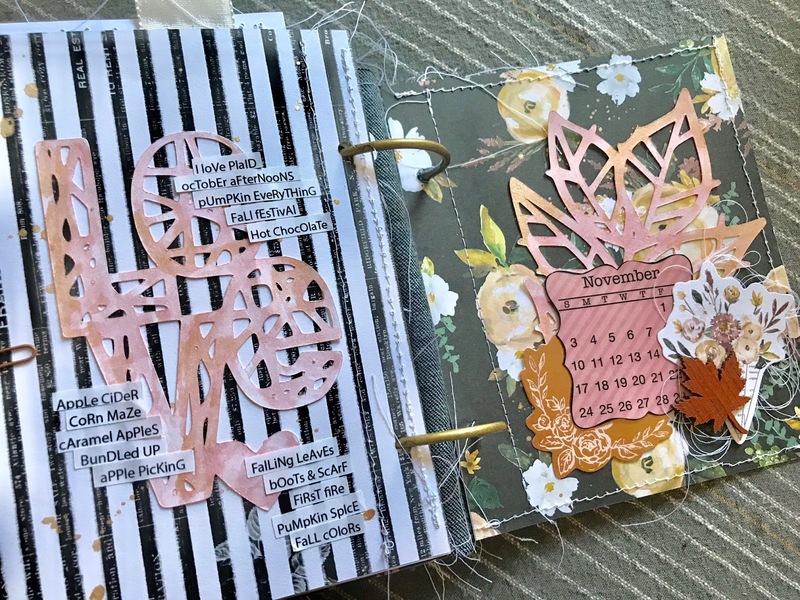 These cut files are available to everyone whether you are a subscriber or not, but you will find that these cut files are designed with the kit in mind and will be gorgeous if paired with the kit. 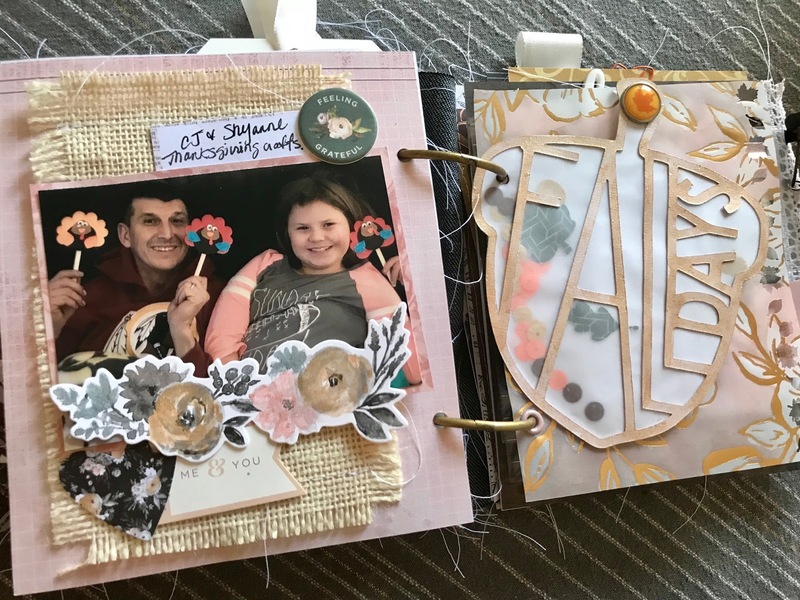 I used the flower tags and frames as some of my pages and filled in the album with other fun patterned papers and cards from the cut apart paper. 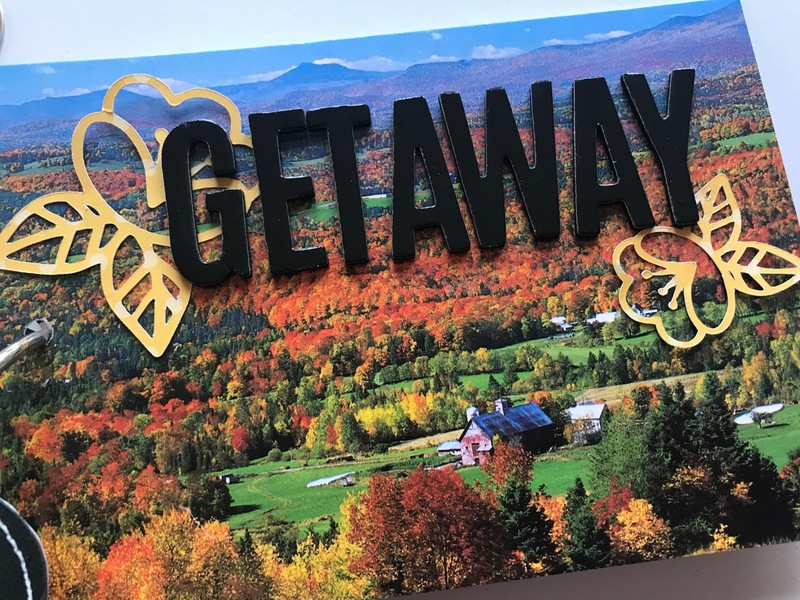 The cover cut file is actually backed with a post card I got while in Vermont and finished it with some beautiful florals and that was it. Picking up memorabilia from your adventures make for fabulous additions to your mini album! 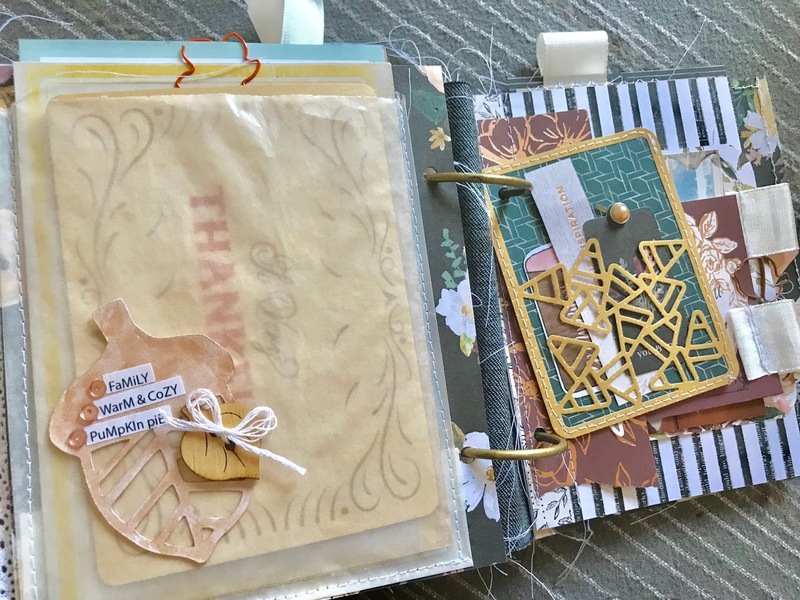 I traced the shape of the cut file tag on patterned papers to create other mini album pages. Added my photo and embellishments...and voila! with a collection like this, it makes it soo easy! The 3x4 card below was part of one of the patterned papers and I hand stitched the sentiment and rounded the corners. I thought it was appropriate sentiment and icon for this trip! The next page I cut by hand and added a couple of photos with a brad. This is another page I created using a cut file and one of my fave pics! My daughter loves unpacking her things in a hotel...I have seen her move her things around to several drawers to determine the best fit...so cute to watch and definitely something to document! The little bags and luggage is so perfect! 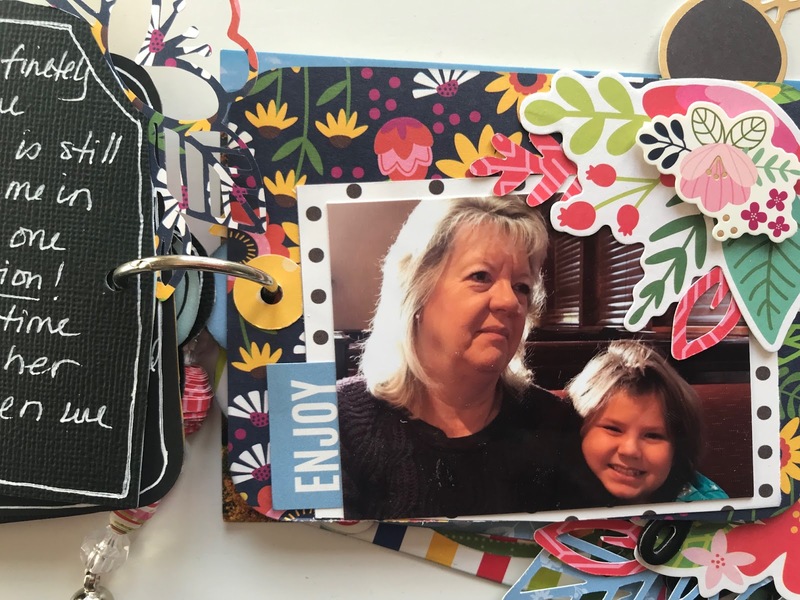 Another page I cut by hand and once I added my photo and beautiful embellishments plus a couple of small flower cut files, it fits right in with the cut file pages. 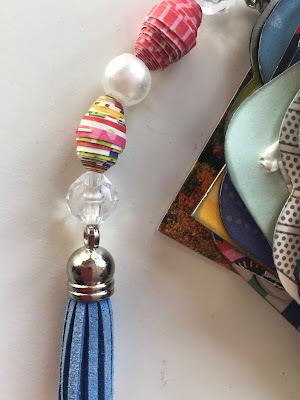 Lastly, I have been so inspired by Lisa Fonseca and her paper beads, I thought it was time to try for myself. They are so simple to make and you can watch how in one of her many YouTube videos. I added some beads and fringe charm and added to my binder ring. This was so much fun to make and the inspiration hit me as soon as I received my March main kit! You never know what kind of inspiration might spark your creativity so make sure you head over to My Creative Scrapbook and sign up for your kits delivered right to your door!! Thanks again and have a great week!! 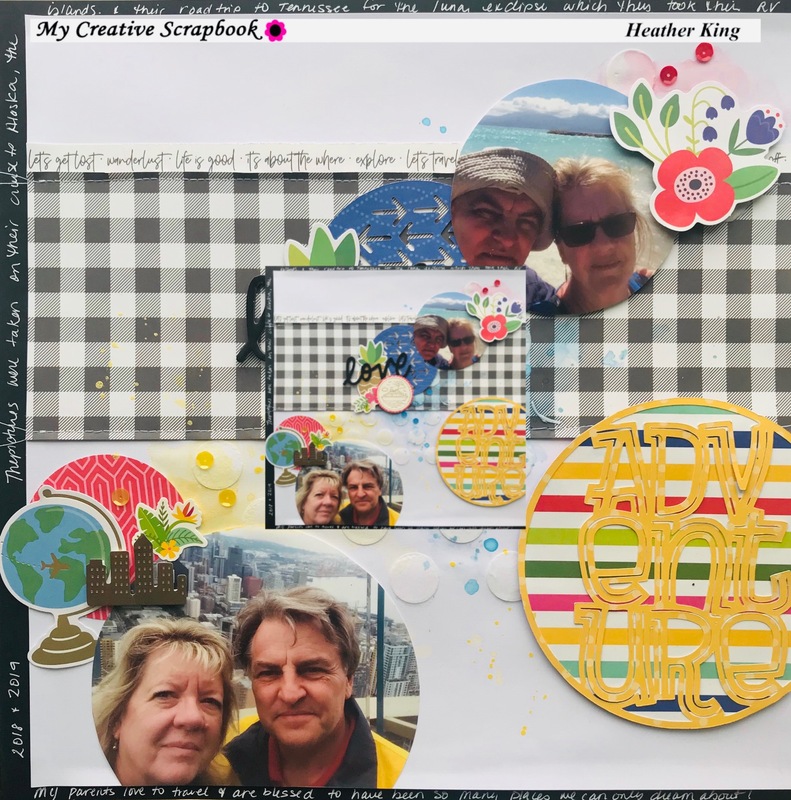 Hi, crafty friends....I have new layouts to share using the My Creative Scrapbook Kit Club March Main kit. This kit is packed with the new Pebbles "Chasing Adventures" collection and has a lot of travel them icons and patterned papers which makes it a fun collection to use for any adventures you or your family have documented. My design came together fairly quickly when using inspiration such as this. I used die cuts and foam stickers from the kit to embellish and I am happy with the way it turned out. Sometimes, you just want to create and not spend too much time debating the design and using a sketch is such a great creative starter! 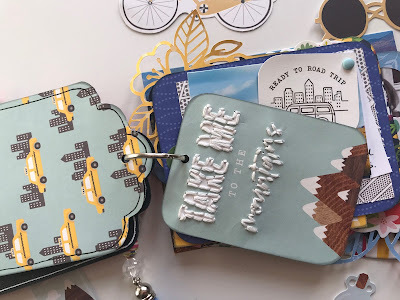 My second layout was actually the fourth layout I created using the kit and I had an idea of the overall design of the layout because at this point, I had lots of the fun little embellishments left. I was struggling though with how to balance the layout because my photo was portrait orientation and it left the right amount of space for those embellishments, but I couldn't decide how to add my journaling! I am not a huge story teller when it comes to my layouts, but there are some pictures that I feel definitely require more than a sentence or two to explain the event. Since my background already had text, I couldn't place it there and I thought about adding around the border, but I thought that would be too busy and hard to see. So, for the first time ever, yes, ever, I added my journaling on little cardstock strips and laid over top my photo. This photo was perfect for it because all of the dark space at the bottom...I can't believe I haven't ever done this before. I have seen it on other layouts, but never felt like it worked for me, until NOW! :) and I am super happy with the result. My third layout, or should I say layouts :)did take the longest to finish and for good reason! Its a double page layout! and the first double layout I've created in years...I don't know why and think I should try to do this more often. 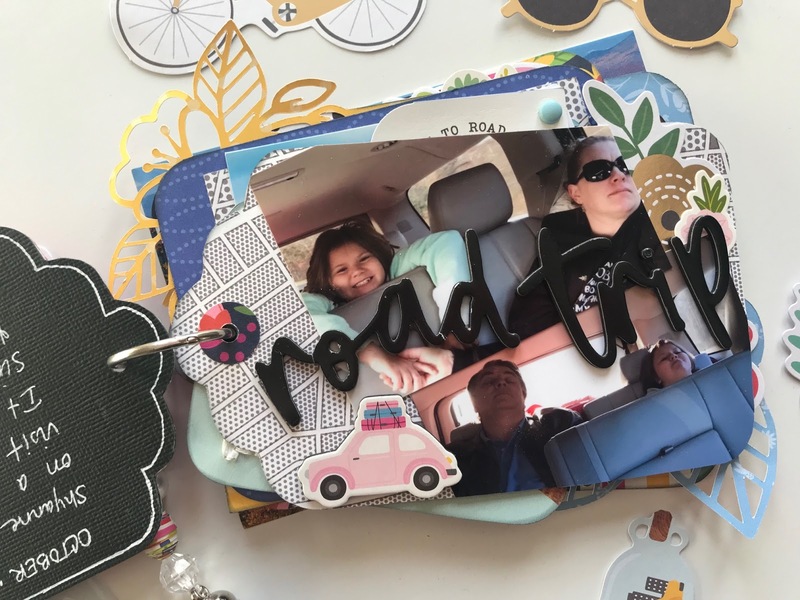 I had several pictures from my parents travels (that I stole from their Facebook account, hehe ) and knew I wanted to document them, but hadn't come up with an idea until I saw the cute cut files created by Ashley Horton from The Cut Shoppe. 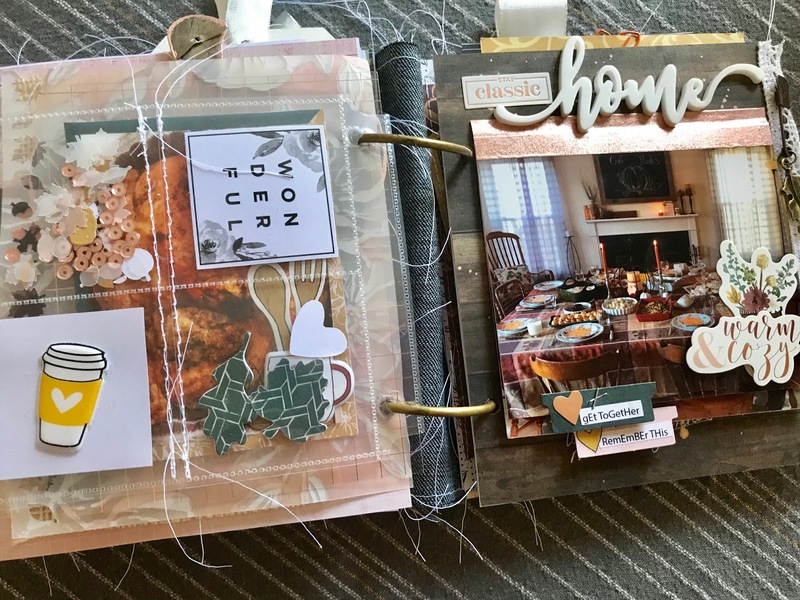 She created a couple of cut files just for My Creative Scrapbook Kit Club based on this months kit. You can find this cut file and others on the website and they are free for all of you to use! 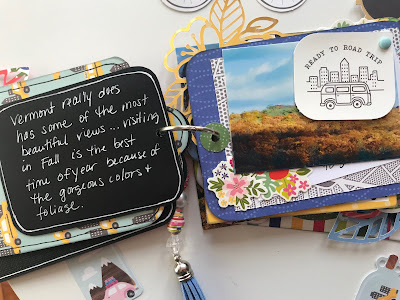 Thanks so much for reading on and I hope you found some inspiration for your next travel layouts! I created one more very special project using this kit, but thought it was worthy of a separate post to come shortly....head over to My Creative Scrapbook Kit Club to sign up for kits delivered to your door! Please feel free to leave any comments or questions below! Hi crafty friends....I hope your February has been love & fun-filled!! I have (4) scrapbook layouts to share with you using the February Main Kit from My Creative Scrapbook....it is filled with Paige Evans Whimsical collection and I love it!! You can find the kit and more information here..and if you hurry, you might be able to still order one if not sold out! This kit includes Whimsical (12) double sided patterned papers, Whimsical flower die cuts, Whimsical chipboard stickers, American Crafts white phrase stickers, American Craft gold foam thickers, & Heidi Swapp stencil. The first layout was inspired by the purple in my daughters shirt....My design idea started with just keeping mainly to pinks and purples in the collection, but I couldn't hold back with all of the gorgeous flowers!! I broke out my border punches too!! I used them on the branding strips to create a grid style background.. to create flower clusters in the top left and bottom right. The bottom left area was perfect for my title and journaling. The top right section I added a few additional embellishments and some inked hearts through the stencil. 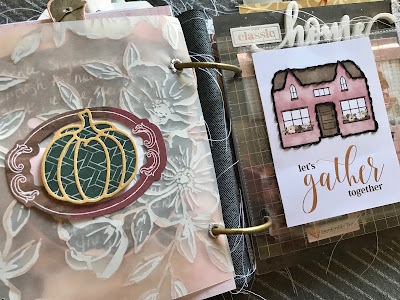 Underneath it all, I used my distress oxides to create a mixed media background to coordinate with all of the embellishments. I cut it with one of the patterned papers and used as a frame for my photo. The other circle was perfect for my journaling. My third layout was the simplest, but definitely, the most tie consuming...I knew I wanted to create shaker pockets with the cloud cut file offered this month because it was perfect to go with my daughters "magical" picture...but I did not want to add all of the adhesive foam to make it happen...check out my process video linked below to see how I did it! Thanks so much for stopping by. Please let me know if you have any questions or comments, I'd love to hear! 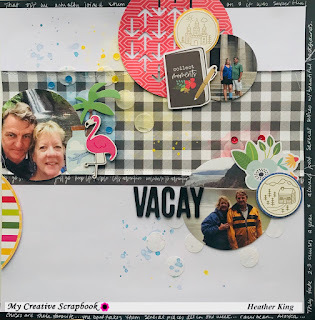 Make sure you head over to My Creative Scrapbook now to reserve your next kit! Hey all...I hope you had a nice holiday season! Welcome 2019! I am looking forward to great things in the new year and hope you are as well! One little tid bit of good news to share is that I have been asked to join the My Creative Scrapbook design team for the year of 2019! Yay....which means, I will be sharing layouts each month using the main kit. 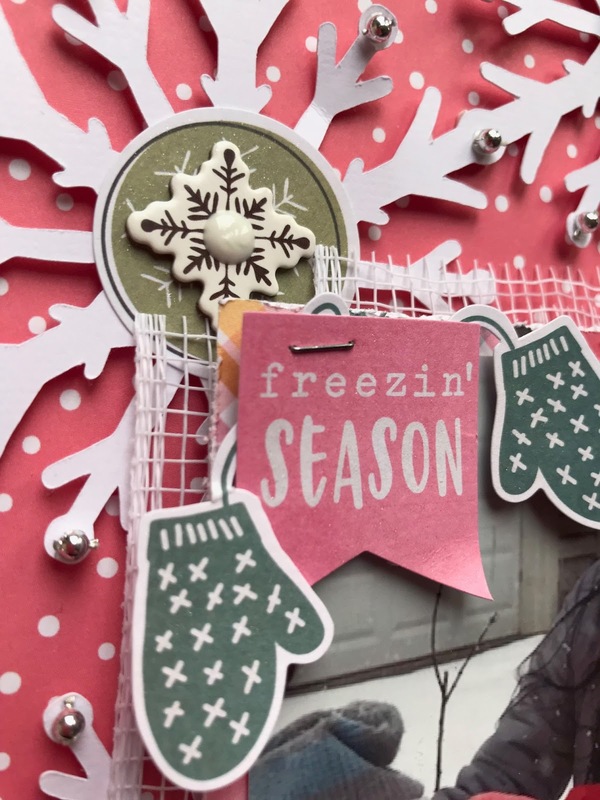 This month, in the January main kit, feature papers and embellishments from the "freezing season" collection from Simple Stories. It also includes a stamp set, American Crafts pink word thickers, white burlap ribbon, and silver beaded trim. This is the first layout I created with the kit. 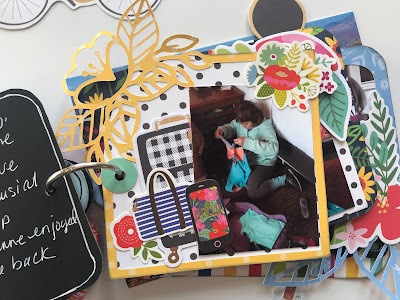 I fell in love with all of the cute chipboard and die cut embellishments in this collection and I really liked the idea of creating a collage of those embellishments. I started with layering the patterned papers diagonally keeping the center portion as a less busy background to avoid the embellishments making it too busy. I did add a layer of clear gesso on the center portion and shimmerz paints to peak behind the pieces. I machine stitched along the striped papers which were the perfect location for my title. My title consists of chipboard pieces and rose gold thickers from Paige Evans. Then, I began placing the embellishments around my photo like a puzzle. Some were popped up on foam tape and some were finished with Nuvo crystal glaze. This adds some shine to otherwise flat die cuts. This is a simple design that works with any collection and anyone can accomplish! The 2nd layout I created is also pretty simple and based on the monthly sketch. Its quite the same as the sketch, but the purpose of the sketch is to inspire you so however, the finished layout turns out. My interpretation is a loose one, but I am happy with the way it turned out. 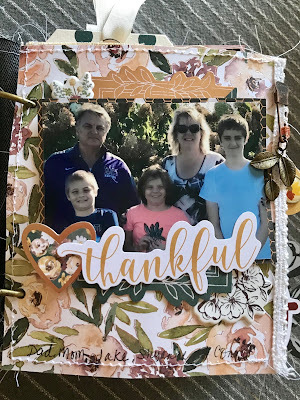 I used a couple of the cards on the cut apart paper to balance my photo and to balance the layout, I layered strips of the patterned papers on the top and bottom of the page. I also tucked in pieces of the burlap ribbon in those layers. To watch my whole process, keep a look out for the video on my YouTube channel coming up in a couple of weeks! My third layout is a fun monochromatic mixed media page. 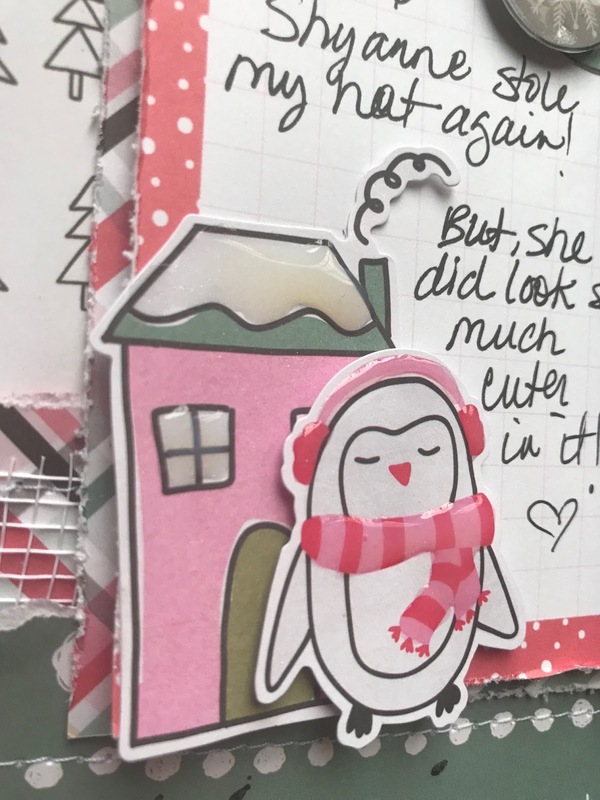 I started with the cute penguin page and fussy cut around them about half way up. I have seen this same look on other layouts recently and thought it was fun. 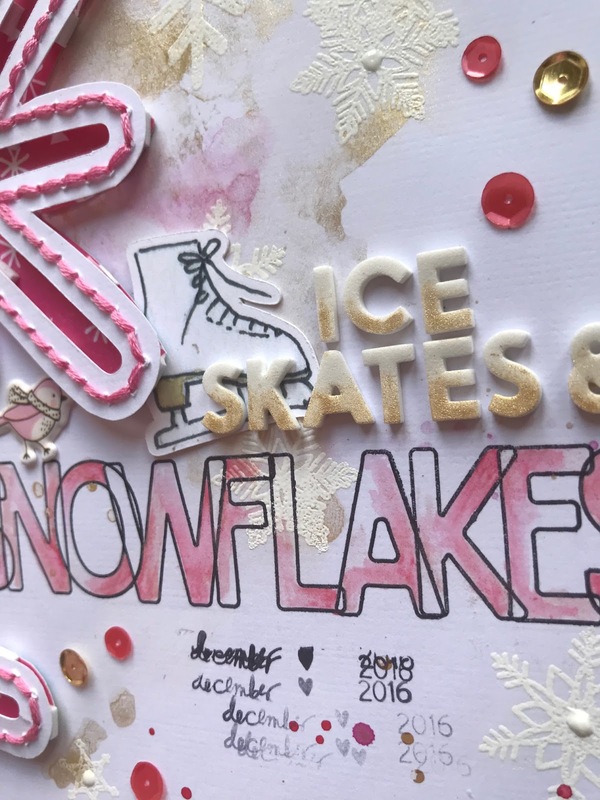 On the background, I spread a layer of texture paste through a snowflake stencil from Echo Park. 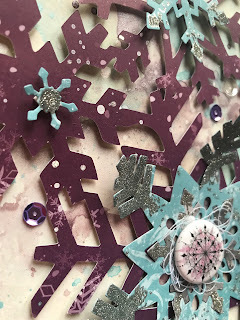 Once dry, I painted on matching Shimmerz paints for a little bit of color, then added a few snowflakes I cut in vellum and white cardstock using a Simon Says Stamp die. Next, I pulled all of the mint/green/blue embellishments to layer in clusters on either side of my photo. This layout was time consuming because of the mixed media, but a simple design and I loved the way it turned out! On my 4th layout, I used one of the exclusive cut files offered by My Creative Scrapbook and cut from white cardstock. I popped up the entire cut file up for dimension and then layered chipboard and die cut pieces in the center of the snowflakes. To watch my whole process, check out my YouTube video...you may see a few unexpected details. 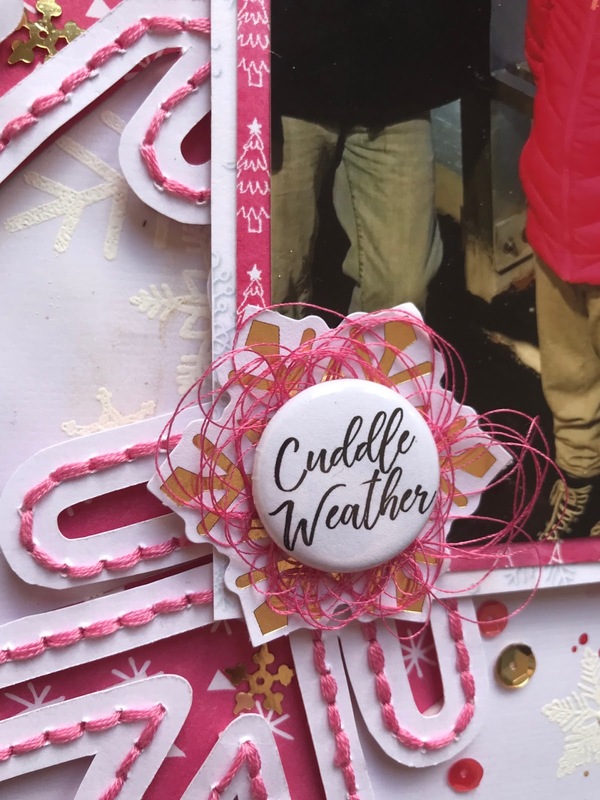 Thanks so much for stopping by to check out these projects using the January Main Kit from My Creative Scrapbook Kit Club. If you like these pages, you will definitely be interested in this kit! Head over to the website to check out this kit and the others. Hey crafty friends...Its been a minute since I've posted, but I have (4) layouts for you today created with the December main kit from My Creative Scrapbook kit club! This is my second month as a guest designer and its been so much fun receiving current products right at my front door as well as some fun coordinating products! 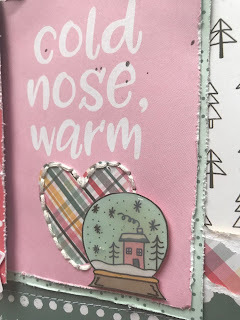 The current December main kit includes products from Simple Stories, Echo Park, as well as some ribbon which is always fun to add for texture! If you aren't familiar with MCS, check out their website for the current kits...they offer several different kits packed with different collections and project ideas! Each month the design team creates dozens of projects with these kits prior to the kits being shipped to all subscribers...this way, when you receive your kit, you have inspiration that same day! 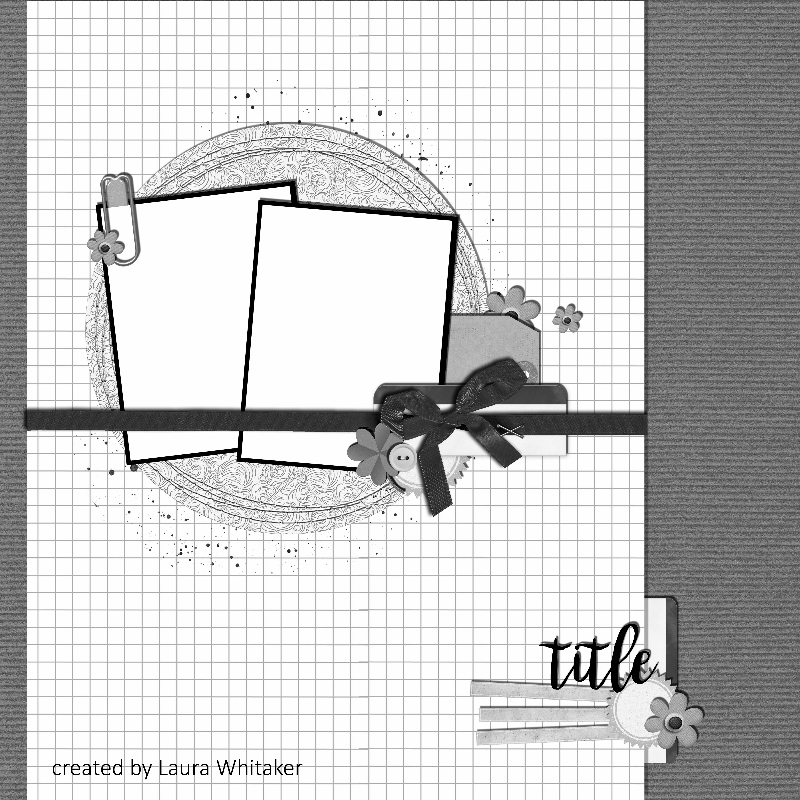 There is also a sketch shared each month you can use to start with and the are several super cute digital cut files available for free! These cut files can be downloaded from their website in the "add-on" tab for free whether you are a kit subscriber or not! 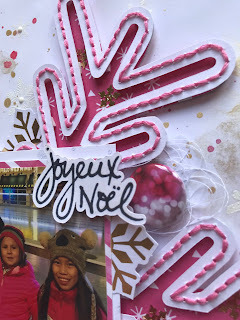 My first layout below.... "Noel" includes exclusive cut files from My Creative Scrapbook. The original cut file is a large circle with poinsettia at the top with leaves and I cut additional poinsettias and leaves to embellish with. I decided that the original cut file in the center was just to predictable...and decided to cut it and add as it both sides were coming off the page. I love the way it turned out and finished it off with a couple of brads from Echo Park and some of the ribbon. The last few details I added were matching Simple Stories stickers and chipboard from Echo Park. I used red brads on the stickers on the right side and finished up with chipboard stars and hearts. All included in the kit. Lastly, I pulled out my red nuvo drops to add to the "berries" on my cut file and my Nuvo Shimmer pen to add shimmer to all of the die cuts. I also used white nuvo drops to add some detail on the background paper. My 2nd layout is a design I have created before, but one of my favorite go to's with collections that have beautiful patterned papers. It is a simple process, but the end result is always beautiful and reminds me of a quilt! I cut 2" squares and cut in half to make triangles and just started laying them down on my background paper. I picked a pattern paper with no color so it wouldn't end up looking too busy and competing with the patterns below. The only challenge is to be sure that the patterns and colors are spread somewhat across the page. I matted my photo and adhered on fun foam following the same angle as my "quilt" and then added my title from the chipboard words from American Crafts included in the kit. 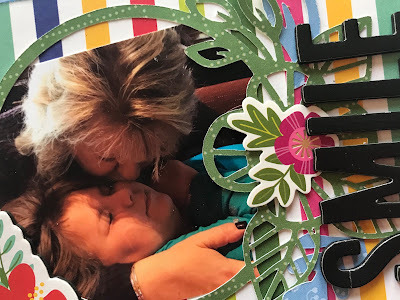 I pulled a few die cuts and chipboard pieces to embellish around my photo and added some splatters with my Shimmerz paints for a little more color on the top portion. 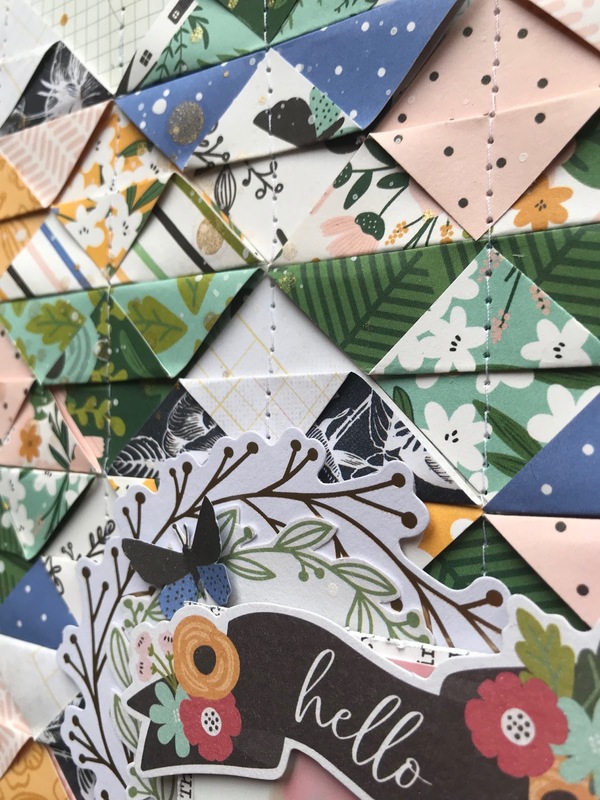 Lastly, I thought the layout needed a little cluster on the bottom right to balance it overall and just added a few more die cuts and chipboard pieces and kept it small since there is already so much color and pattern. My 3rd layout was so much fun to create and may have been partially due to the story behind it...My husband gave me a polaroid camera for last year which was so exciting so I was taking pictures of all sorts of things with it...a couple of those pictures were of my new ornaments. Each year, I receive new ornaments from my mother or I've purchased myself, but I cherish my ornament collection so it was appropriate to document! Before adding the "Christmas tree", I added a layer of clear gesso to my white cardstock and smooshed some watercolors from my stash for some color peeking from behind the tree. I used paints from Shimmerz, Hero Arts, and Kuratake Gansai. but the idea of using the brads as other "ornaments" was very exciting! To balance all of the open space in the background, I tore some of the red patterned paper and distressed it some to add to the top and bottom of the page. 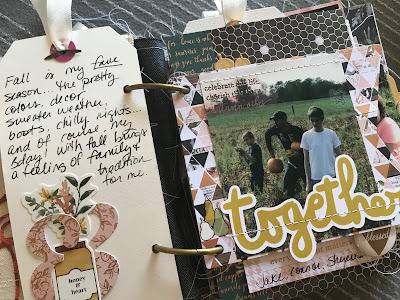 Of course, since there was a long sentimental story to this layout, I had a lot to say in my journaling and the title says it all, right? 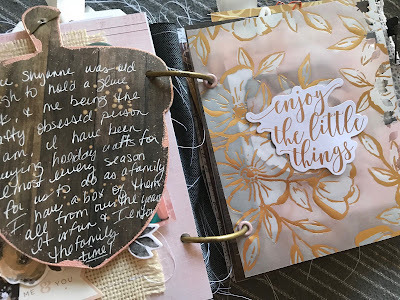 I used a large chipboard word from the kit and the white thickers are from Paige Evans from my stash. I love how it turmed out!! My 4th layout was my most time consuming layout of the four, but my favorite! It is of my daughters holding their new ornaments of the year which is kind of an extension of the story from my 3rd layout...can you tell our ornaments are huge in my family?? That being said, I had a lot of journaling for this one as well, but since the layout was about ornaments, I thought I would break out my paper punches (yep, I said punches!!) to create little embellishments "ornaments" to "hang" on my page....I used the red and green ribbons included in the kit to make bows for each ornament and really thought the hand stitching made it complete! I used coordinating colors of embroidery floss and the chain link stitch to create all of this beautiful texture....My inspiration behind the stitching is definitely, Paige Evans...I have been sewing for years, but after watching video after video of Paige Evans hand stitching on her layouts, I thought, I can do this! I learned this type of stitch from her as well and she has several videos on her YouTube channel explaining the process. Once you've done it a couple of times, it is easy ad anyone can do it...and floss is cheap and lasts a while, so if you haven't tried it...go ahead and experiment. You can start small with simple shapes like this one and I am sure you will be hooked! Each ornament has a combination of die cuts and chipboard embellishments which some I've popped up on adhesive foam and most all, I used my Nuvo shimmer pen to add some sparkle..because everything looks better with sparkle! Lastly, I wanted to added a little bit of "shine" coming from each ornament which I added with watercolors from my stash....I think the background was too white for my taste anyway! My title came from the echo park chipboard in the kit and I added some white thickers from Paige Evans from my stash. Thanks for sticking with me till the end...I hope enjoyed looking through my projects for this months kit from My Creative Scrapbook. Maybe you found some inspiration of your own....? 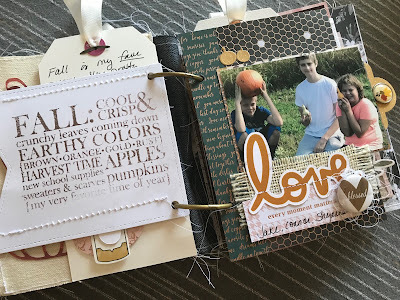 You can also find more ideas and inspiration from the other designers in the gallery on the website and you can see the complete details of each kit's contents as well. 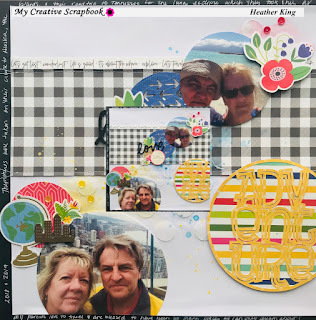 Please free to leave me any comments or questions and then head over to My Creative Scrapbook Kit Club to sign up for next months kits!! Happy Holidays and have a great crafty week! Happy News + new scrapbook layout share! Hey friends...yes, I know its, been quite a while since I posted, but I have still been busy creating and I have some new projects and news to share! 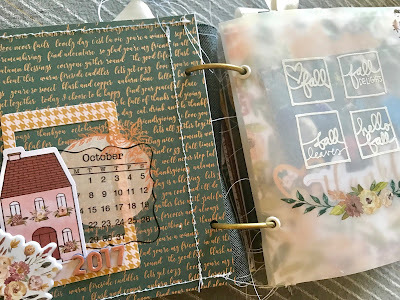 Recently, I was asked to be a guest designer for My Creative Scrapbook Kit Club for the next few months! yes, I know, awesome...I am very excited to be receiving their kits....They offer several different kits featuring different products that really cater to different scrapbookers...personally, I love each type of kit, but there is something for everyone! Each month, I will be sharing a minimum of (4) projects using the Main Kit and the November kit was packed with Pebbles "Along the way" collection. 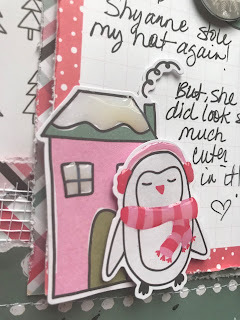 I love the papers and die cuts in this collection. The main kit also includes alpha stickers and some ribbon trim which I was definitely able to incorporate! 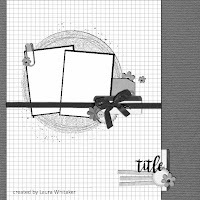 Below is one of the layouts I created...and actually it was the fourth layout I created, but this was my favorite and I recorded this one so you could see the process and how I created the background. Make sure you check out my YouTube video linked below to learn how to create this quilted background! This is layout #2....I didn't use as much patterned paper and embellishments for this one, but I did use one of the exclusive sets of free cut files offered this month...I backed the flowers with patterned papers and vellum from my stash. I layered some of them and used my sewing to stitch threw them in order for the edges to lift. I also incorporated some of the matching die cuts and used the gold thicker word as my title. I did use white gesso to white out the center of the black patterned paper so the flowers would stand out more and I could add some watercolors. Then, I finished it off with lots of matching splatters. This is layout #3....and I created this layout based on the monthly sketch provided as inspiration....It isn't an exact take on the sketch, but it got me going and that's all that matters! I started with the branding strips from all of the lovely patterned papers in the kit and I knew I wanted to use the die cut circle, that has "love begins at home" on it. From that, I pulled out and fussy cut any of the houses I found and thought it would be fun to layer them horizontally with my photo. I machine stitched through each strip along the bottom and added a layer of white gesso on the background paper in order to add a little mixed media behind my photo. 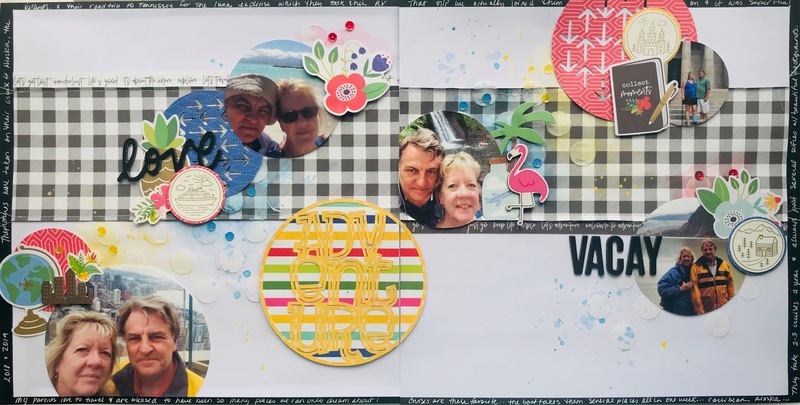 My last layout using the main kit also uses another exclusive free cut file offer by My Creative Scrapbook Kit Club. The cut file actually started as a doily shape, but I removed the outer cut border in order to keep the shape in the white cardstock. This allows me to back it with some beautiful patterned papers. For a border for the layout, I gutted one of the gorgeous floral papers so it appeared as though it was a frame....I add some machine stitching for texture and then started adding embellishments to coordinate with each color doily. This picture is of my daughter and husband and it was taken before her first band concert. That said, there was a program for the event that I wanted to include with my journaling, so I tucked it in behind my photo with some die cut tags from the kit. To finish up, I added some splatters and my title using the alpha stickers from the kit. 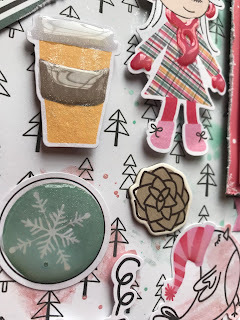 Thanks so much for checking out my projects this month for My Creative Scrapbook Kit Club. I love the way they turned out and hope you are inspired to try some of these techniques on your next project. Also be sure to check out the different kits available this month...before you know it, it will be December and they will be gone so don't miss out! Hey, crafty friends...I have two scrapbook layouts to share with you showcasing a matching die and stamp set. 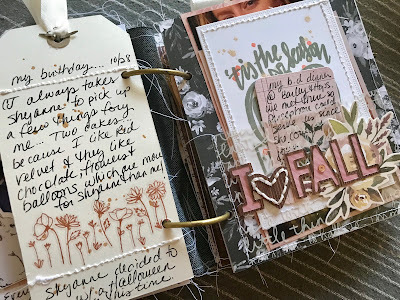 I love using my stamps and dies to create my own backgrounds and embellishments. 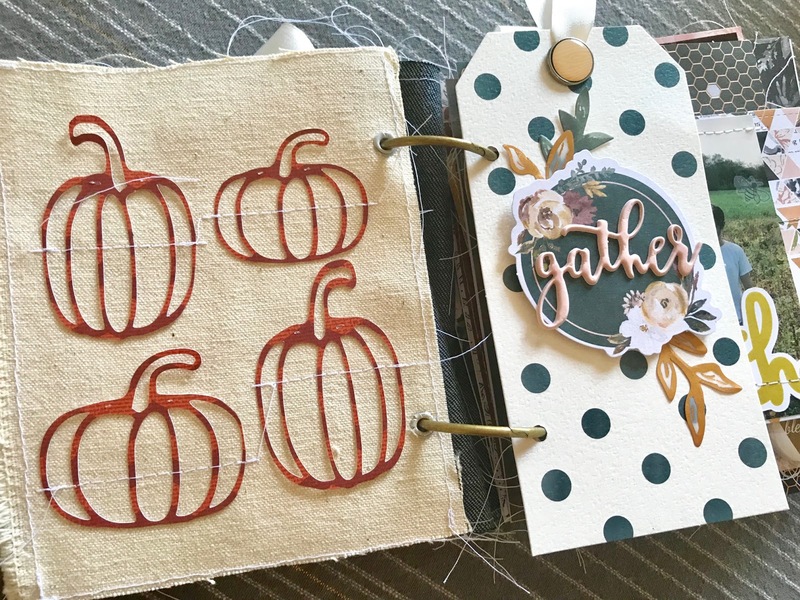 Using your dies and stamps makes it easy to personalize your projects! Plus, they are usually the more expensive items in your stash, therefore, the more use they get, the better! 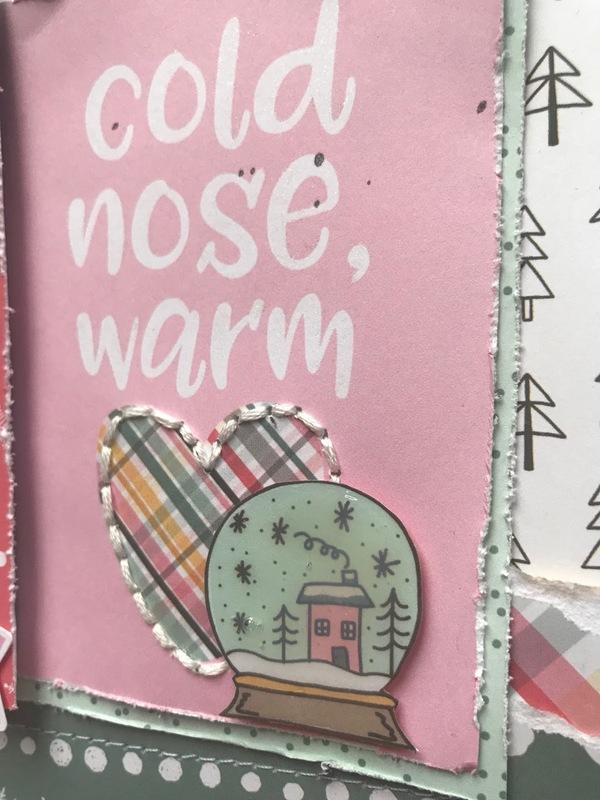 I love snowflakes and the Concord & 9th Snow Flurry stamp set and matching die is one of my favorites! 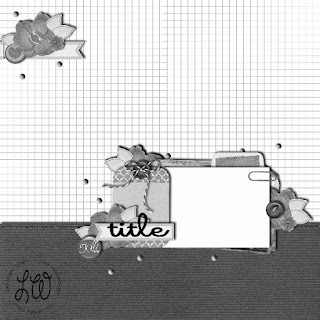 The first layout was created using the Snow Flurry stamp set on my background. I started with a piece of white cardstock and added gesso to prep it before adding mixed media. First, I stamped the snowflake images randomly with versamark ink, then heat embossed them with clear embossing powder. 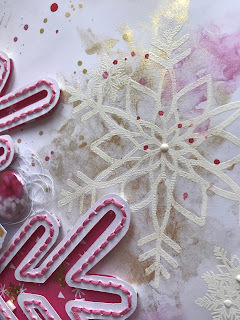 To make them visible and for subtle details in the background, I used Picked Rasberry Distress Oxide Ink, Shimmerz paints and the smooshing technique to add some color which makes the snowflakes pop! My title was created with Paige Evans thickers that I partially painted to make sure they stood out from the background. The other part of the background was stamped with Archival black ink and an apha stamp from Elles Studio, but here is a comparable one from the Butterfly Reflections Ink shop - outline alpha stamp set, then partially painted with Picked raspberry distress oxide ink. I used Archival black ink because it is waterproof and won't smear when I added paint to it. 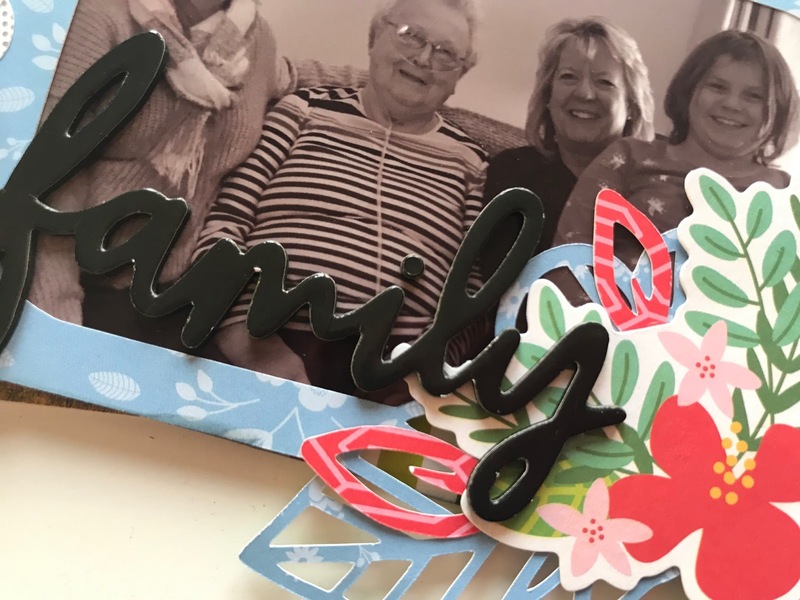 The large snowflake is a Paper Issues free file cut on my Silhouette Cameo. I hand stitched the outline with pink embroidery thread and backed it with patterned paper. I also added some little snowflake sequins from Spiegelmom Scraps inside the snowflake. For finishing details, I included some Neat & Tangled sequins and white Nuvo drops. The die cut embellishments are from Pretty Little Studio and the flair is from A Flair for Butttons Etsy shop & Cuts2Luv Etsy Shop. 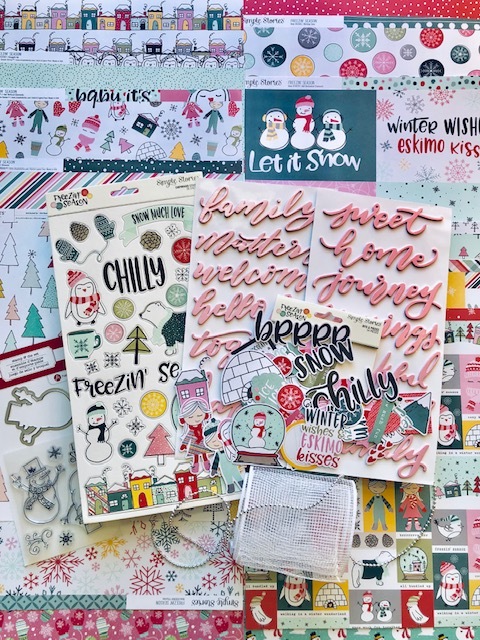 The patterned papers are from Crate Paper Snow & Cocoa collection. 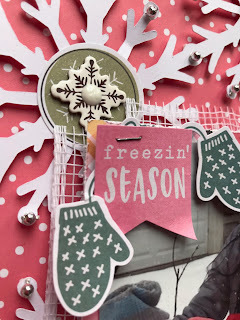 The second layout used the Snow Flurry die set to add dimension and texture. 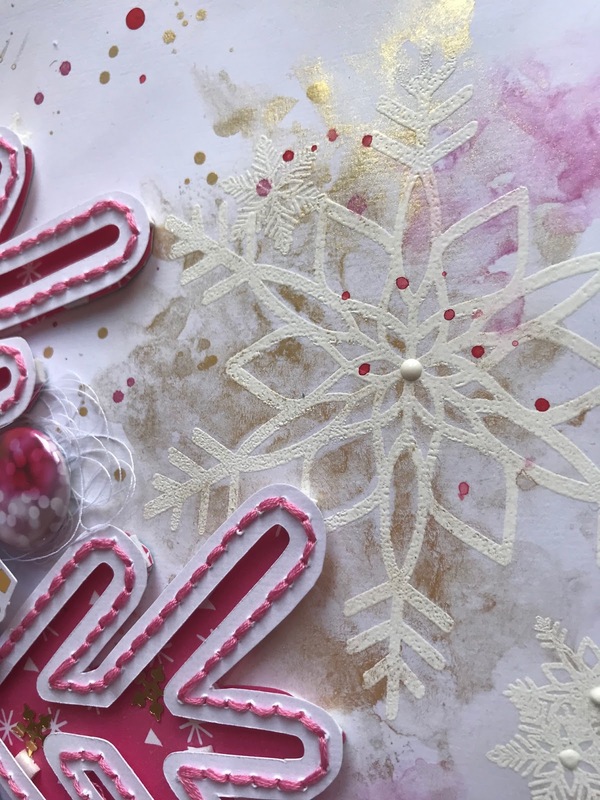 First, to create my background I added gesso to prep the patterned paper, then used Salty Ocean Distress Oxide Ink and Seedless Preserves Distress Oxide Ink to add color that would peek through the snowflakes. I used a snowflake Just Nick Studios file to cut on my Silhouette Cameo from patterned paper, then I cut several snowflakes from the die set. I love this die set because even though there is only two actual dies, it cuts three pieces and can be layered multiple ways. 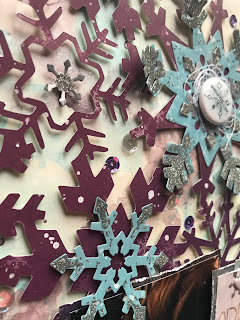 I cut them in patterned paper and layered them over my large snowflake cut file, then to add some shimmer, I used my Nuvo glue pen to adhere Distress vintage platinum glitter dust on the edges. 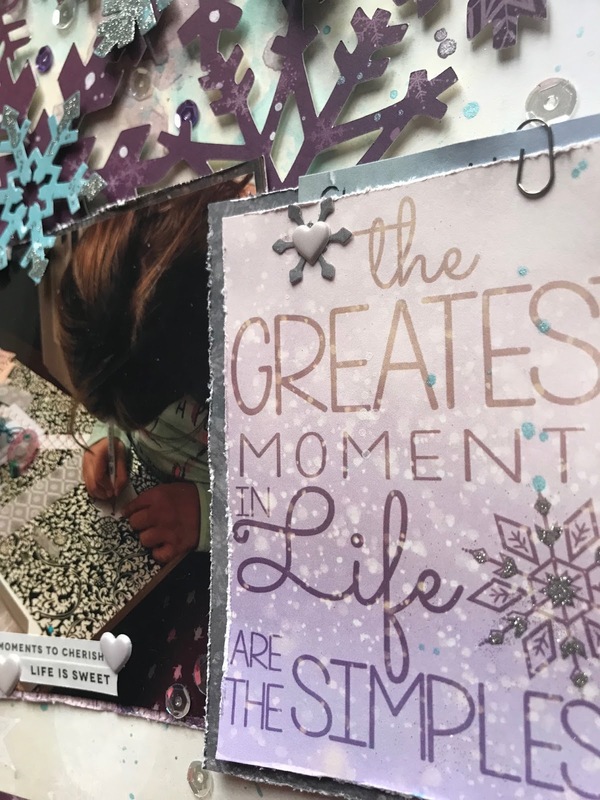 This picture is of my daughter while in my craft room with me creating Christmas cards which I cherish always. Therefore, I had quite a bit of journaling I wanted to include and decided to tuck it in behind my "title" and picture and secured it with a tiny paper clip. For finishing touches, I added Pinkfresh Studio heart stickers and Neat & Tangled sequins. The flair button are from Cuts2Luv Etsy Shop and the patterned papers are from BoBunny. Lastly, I used my Tonic Aqua shimmer pen on just about everything I could add it to! 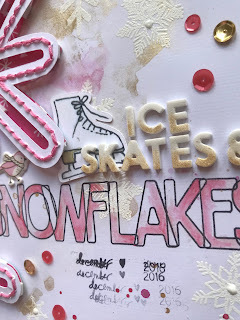 I hope you enjoyed all of the snowflakes and are inspired to head over to the Butterfly Reflections Ink online shop to check out all of the lovely holiday goodies!! Please feel free to leave any comments or questions below. 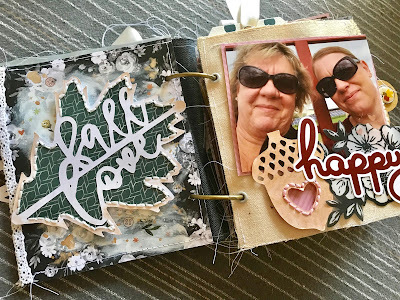 Hey crafty friends....I have another mini album to share....I know, I know, I have been on a mini album kick lately...and actually, I have a whole container full of pictures and ideas for all of the mini albums I want to make....I will be done with that list in a few years! :) This mini album features the Pink Paislee Auburn Lane Collection and includes all of my favorite memories made during the fall season! 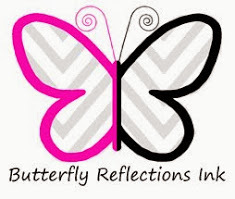 Before I get in to the details and pictures...I am sad to say this will be my last design team post, but I want to share my gratitude for the opportunity Vanessa provided me by accepting me as part of the Butterfly Reflections Ink design team. It has been so much fun and a dream come true! OK...enough with the mushy stuff and on to the crafty stuff! 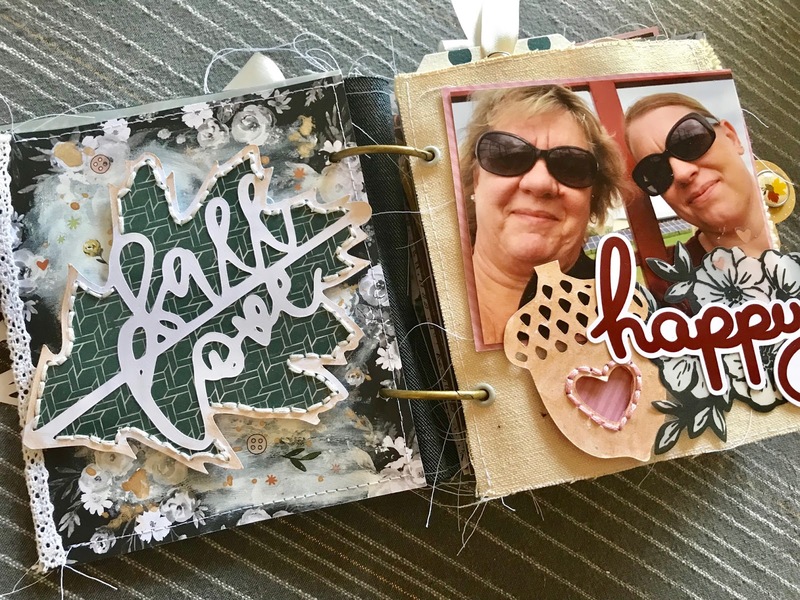 This mini album was definitely a labor of love, but totally worth it in the end...I started with matting my photos and planning my pages with the 6x8 paper pad including the cover and back. 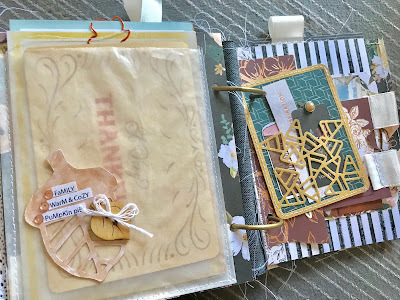 I decided to do something different with this mini album and incorporate some old denim from my stash. I added some charms to the binding ring and tied some white ribbon on. 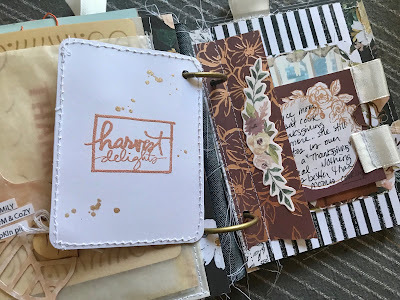 The cover was created with a card from the ephemera pack that I hand stitched as well as the Pink Paislee Gold Thickers. I absolutely love these foam thicker alphas...they are the perfect size and these colors! 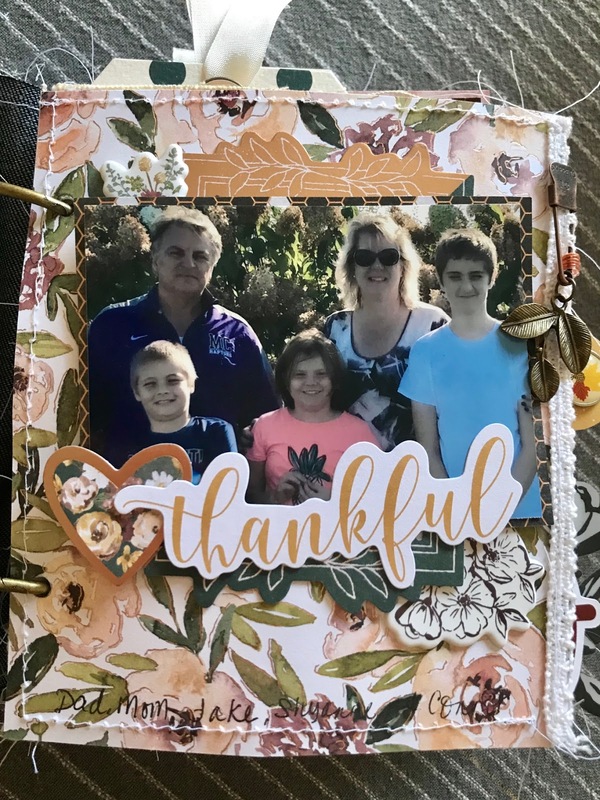 I started with the traditional pumpkin patch and hay ride photos of my family including my parents, nephews, and brothers....It is a tradition we try to do together every year! I used cut files from The Cut Shoppe throughout and added quite a bit of hand stitching as well which is not my forte, but I love the texture and dimension it adds. Next in line is my birthday which is in October and that definitely deserves documenting.....My husband always showers me with gifts and my entire immediate family meets for dinner. To add to the Auburn Lane embellishments, I pulled stamps and dies from my stash as well brads & flair buttons. 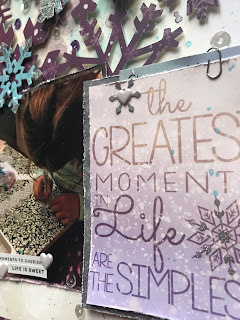 My husband, daughter, and I have been making holiday crafts since she was older enough to hold a glue stick...I have a box of all of the holiday crafts we've made over the years and its a tradition I like to document every year. I used lots of different types of materials to incorporate into this mini album to keep it interesting through to the end....look through your stash and pull out vellum, acetate, tissue paper, baggies, fabrics, etc....they all can be used and visually, it keeps the eye drawn in! 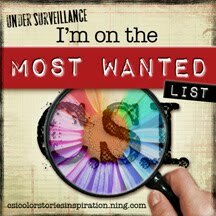 There are more pages and details to see, however, if I included all of the pictures, this would be the longest post ever!! To see a flip through of this album as well as more details on how it was made and the products used, please check out my YouTube channel linked at the bottom of this post. 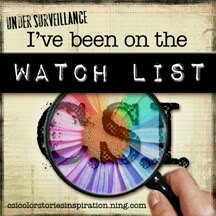 I also used products from Pretty Little Studio, Shimmerz paints, Bramble Fox & Tim Holtz. 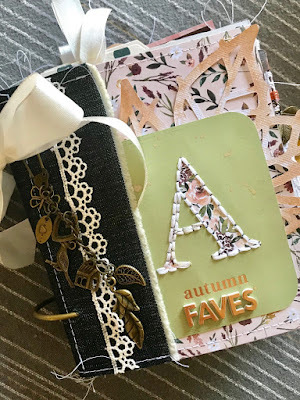 Thanks so much for sticking with me on this post and I hope you are inspired to create your own "Autumn Faves" mini album or project! Please feel free to leave a comment or any questions you may have below...I'd love to know what you think! Hi! I'm Heather and live in Maryland, USA with my husband and two beautiful daughters, Persephone & Shyanne. By day, I am a mother, wife, and kitchen designer which challenges me and fuels my creativity. However, my passion for scrapbooking, making cards, or anything crafty soothes my soul! 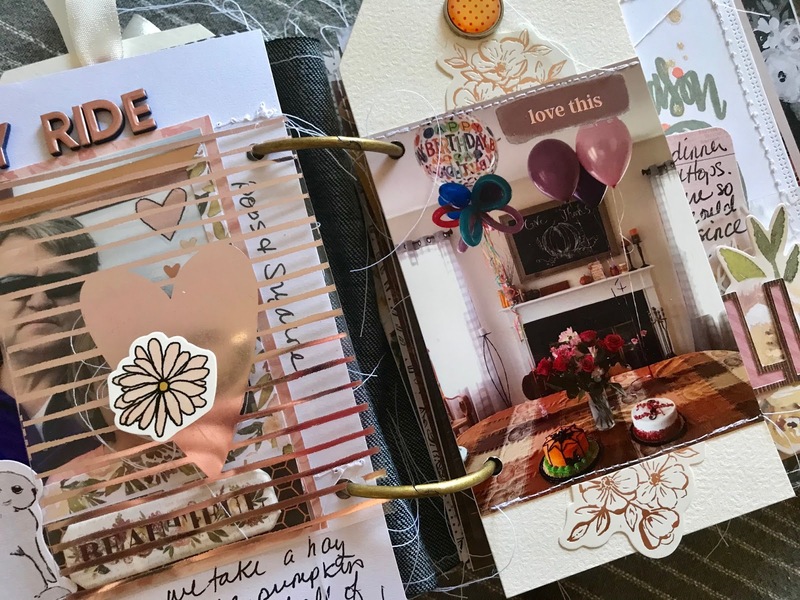 Scrapbooking is where it all began, but over the years, I have fallen in love with making cards, mixed media, and designing my own home décor. I also enjoy shopping for crafty supplies (who doesn't?!) and watching Hallmark movies...holiday ones are the best! I love music and singing and enjoy living room dance parties with my youngest. I am so happy to share my creativity with you!